ZAPFREE is offering the ability to record and playback end-to-end test procedures using user friendly Step View, parameterization of dynamic values, validation of expected results and execution of the same test script on multiple platforms (i.e. Cross-Browser; native Mobile iOS and Android; and desktop applications). 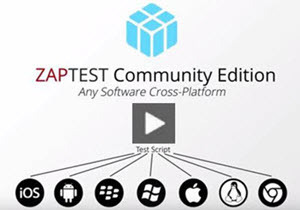 ZAPTEST Community Edition uses the same ZAP revolutionary 1Script Technology that is used in our ZAPTEST market leading Enterprise Edition that is helping many companies with software testing daily. It comes with most of the features of the Enterprise Edition, and a single paid license key unlocks all the Enterprise Edition features. “The Role of Quality Assurance in the modern SDLC has been demoted due to the lack of efficient QA tools to address just-in-time testing in today’s rapid software development process. With ZAPTEST we are optimizing testing processes, and are offering 100% QA time during development cycle. ZAPTEST is the new generation of test automation solution, it empowers software test professionals to automate testing before application under test has been developed; and to execute test with one script as-is cross-platform on multiple devices and workstations at once. We want to make the Software Quality Assurance profession…Great Again!” said Alex Chernyak, ZAPTEST President and CTO. ZAPFREE Beta program is available for download and support through the ZAPTEST website and Forum. ZAPTEST will be showcasing ZAPFREE Community Edition at the Better Software East Conference in Orlando, FL November 11-12th at the Hilton Orlando Lake Buena Vista. ZAPTEST has been developing and delivering leading solutions for more than 15 years. As pioneers of software test automation – we started as a Mercury Interactive/HP Elite Partner, and were involved in advanced test automation innovations and implementation in USA and Worldwide. ZAPTEST is a software test automation solution for testing applications Cross-Platform, which allows testing of any GUI based software on any modern OS, mobile or conventional. This includes iOS; Android; WinMo; Blackberry; Windows; Mac; and Linux, and supports testing of Agile and CI development. ZAP’s main technologies are ZAPTEST; ZAP-fiX; MultiRun; and zapFARM. ZAPTEST solutions are oriented to test optimization making it possible for organizations to reduce their overall investment in software testing and increasing testing ROI. ZAPTEST offers less time for test artifacts development and maintenance as well as allowing testing teams to start test automation early in the development cycle.